Food safety measure is part of the Sanitary and Phytosanitary Standards (SPS) which aim at protecting human health by ensuring food safety. Their implementation and compliance with the importing countries could influence the food trade performance of the exporting countries. 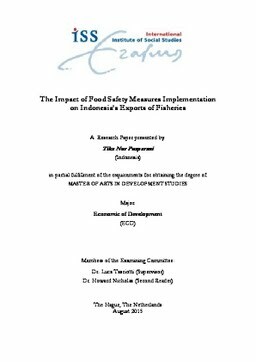 This paper analyzes to what extent food safety measures implementation by the main destination countries affects Indonesia’s Fisheries exports. United States, Japan and European Union are the main importers of Indonesian fisheries and they have consistently applied the food safety measures. Therefore, the examination of the food safety measures impact to Indonesian fisheries exports is focused on these importers. Inventory based approach employing a number of food safety regulation and border detention is analyzed using exploratory data analysis (EDA). The result suggests that even though not very significant, the food safety measures still negatively influenced fisheries exports to Japan while the falling demand of fisheries in this country was also responsible for the decline of Indonesia’s fisheries exports. Meanwhile, the negative effect was not seen in fisheries exports to the US and EU. Furthermore, the great portion of food safety cases faced by fisheries in the recent years, shows that food safety measures in the importing market still have caused problems and risks to Indonesia’s fisheries exports. Therefore, food safety standard harmonization between Indonesia and importers as well as the consistency in the application of food safety practices is necessary to comply with the food safety measures of the importing countries.